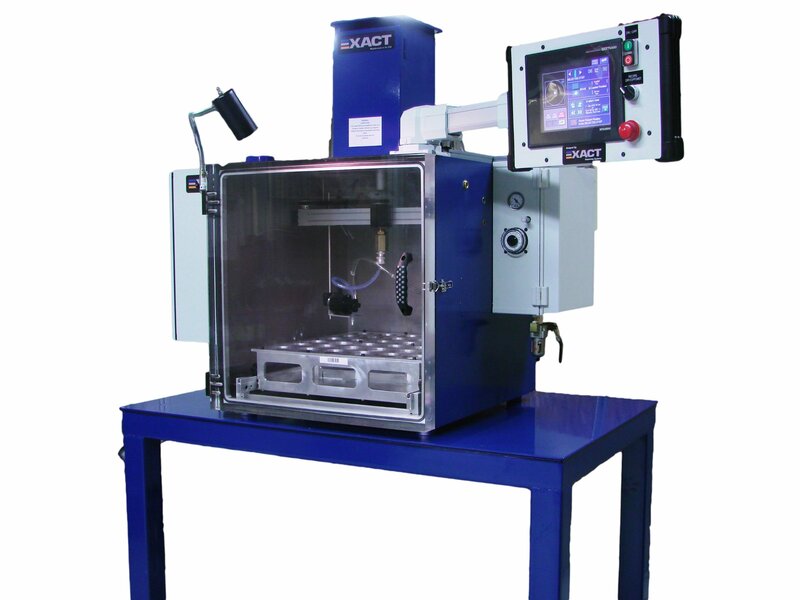 EXACT Dispensing Systems offers a full line of vacuum chamber equipment and dispensing systems for customers involved in vacuum potting or vacuum encapsulation applications. These systems provide a proven solution for maintaining a dispensing environment which is free from air. Applications include potting or encapsulating of EV motors, linear drive motors, connectors, coils and other electronic components. The vacuum process provides improved impregnation in difficult to reach areas (i.e. connection pins, under circuit boards) and ensures void free encapsulation. With the advent of quick setting resins a user can, in some cases, perform vacuum potting of components and ship them the same day. A typical configuration will consist of a single component dispense unit or a two-component meter, mix and dispense system, a 24" x 24" x 24" vacuum chamber with a clear acrylic door and a 22" diameter platen, plus a high-quality rotary vane vacuum pump. Smaller chambers are available, based on specific customer needs. Controls range anywhere from a completely manual system with hand crank positioning platen, to a system that features fully automatic positioning of both the platen and dispense head. The latter provides a complete auto-cycle for multiple parts production, and can include soak and dwell parameters. The system is designed to accommodate typical vacuum encapsulation process parameters (200 to 2 Torr), and pulldown times from 30 seconds to 2½ minutes. Higher Torr ratings and faster pull down times are available with optional vacuum pumps. All of our vacuum chamber equipment and dispensing systems may be purchased as stand-alone products or complete system solution for applications other than vacuum encapsulation or vacuum potting. Request a custom quote on our vacuum chamber equipment and dispensing systems in minutes by clicking here. Thanks for choosing EXACT Dispensing Systems!